The lazy days of summer are behind us and it’s time to think about the hustle and bustle that comes with getting kids out the door to school every morning. Preparing lunch for your children each day is only one thing on a long list of chores to get done, so why not hand this one off? If you involve your children in preparing a healthy lunch for themselves, chances are they’ll be more likely to actually eat it. Toss all the fruit together in a big bowl with the pineapple juice. You can adapt this salad to your own tastes by substituting any of the ingredients with fruits of your choosing. Place the tortilla on a flat surface and spread with thin layer of mayonnaise. Layer sliced turkey on top and top with chopped tomatoes and lettuce. Roll up tortilla. This Curry Dip isn’t too spicy and is always a big hit when I make it. 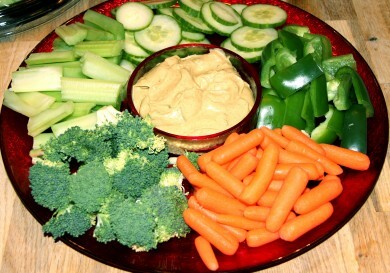 I just gave some examples of veggies that go well with this dip, but you can use your favorites. I love this recipe because it uses items you usually already have in the cupboard. Mix all ingredients together and let sit from anywhere from two hours to up to two days. Preheat oven to 450°. Arrange pitas on a large baking sheet. Spread a thin layer of pizza sauce on each pita. Add a sprinkling of grated mozzarella. Top with your favorite veggies. Bake for 10 minutes. Preheat oven to 250°. Place Shreddies, Cheerios, cheese sticks and pretzels in a large bowl and mix to combine. Mix oil and Worcestershire Sauce. Slowly drizzle oil over cereal mix, tossing as you go to ensure mix is evenly coated. Toss with garlic salt and seasoning salt. Spread mix on a couple of foil-lined baking sheets and bake for 3 hours, stirring occasionally. Remove mixture from oven, allow it to cool, and store in an airtight container. I have never had curry dip but it sounds interesting. I like sweet but this just might have a little kick to it. Thanks for the list of ingredients.